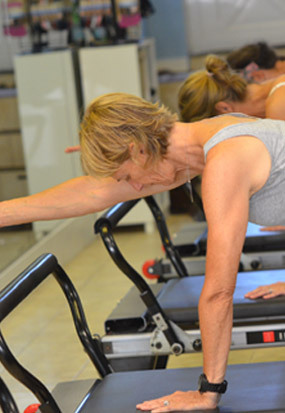 Pilates enthusiasts now have yet another way to incorporate Pilates into a mixed workout! Barre Pilates blends ballet dance techniques with the standard core workout of Pilates which provides a graceful balanced exercise routine. Dance and Pilates have long been connected. Joseph Pilates’ wife was an accomplished dancer, and many of the early adopters of Pilates were ballet professionals looking for a core strengthening program to increase their flexibility and strength. Today, Barre Pilates classes eliminate the tutu, flat slippers and pointe shoes, but incorporate the familiar wooden bar of the ballet studio to provide balance and a support / resistance point to work off of for complex stretches, muscle workouts, and more. A barre class is typically taught in an open studio with mirrored walls, with mats on the floor for floor exercises and a bar installed like a traditional ballet studio. The various moves performed at the bar can involve a wide range of muscle groups, and focus on control and form. Barre originated in London approximately 50 years ago with the famous German dancer Lotte Berk, and it has become increasingly popular since then, with celebrities like Madonna becoming advocates. Barre classes start with a stretching and warm-up segment, then move from the floor the barre and back again several times. Some instructors start from the dance end of the equation and go from there; others take a Pilates program and integrate dance moves; many will add yoga elements, and some even implement bursts of cardio. The main goal of the class involves holding several positions and using a series of tiny isometric movements to intensely work out extremely small sections of the muscles. Posture and alignment are an important part of Barre Pilates. Regular Pilates attire is suggested for barre classes, and most go barefoot or wear grip socks. Some choose to don ballet slippers, but these are normally the students who come from a ballet background. Barre Pilates is an excellent workout for any athlete, regardless of specific discipline.